Synology RackStation RS3614xs+ Rack Optimization NAS is a model for providing performance and function which can respond to large-scale storage services required at a big company level. In aspect of flexibility for this, a simple network configuration that can be used regardless of infra configuration, a wide range of (various) service support, and etc. stand out. Also, it is required several abilities such as providing cost-effective and high-capacity sharing storage space, managing lots of users, and constantly maintaining performance against high work load simultaneously created by the users. This test system configures four gigabit Ethernet ports of Synology RS3614xs+ as link aggregation in a self-adaptive load balancing mode. The disk composes a single group and volume in RAID 5 configuration of 12 Seagate 6TB Enterprise NAS model hard disks. In virtualization environment of client (The clients configured by virtualization), four Window 7 clients are allotted one gigabit Ethernet port for every (each) VM, and maximum 16 threads; maximum four threads workload is applied for each client. Seagate Enterprise NAS HDD, used for test system configuration, is optimized for 4-16 bays of RAID storage system, so high stability and compatibility in majority of disk-composed RAID systems, reliability and performance optimized for constantly operated high load situation, warranty service for 5 years, recovery service and etc. are provided. Particularly, Seagate’s Enterprise NAS HDD is the best configuration for RS3614xs+ as it satisfies storage stability, RAID compatibility, and cost in NAS with a level of 12 bays. ■ Shows outstanding performance even in high load situation. 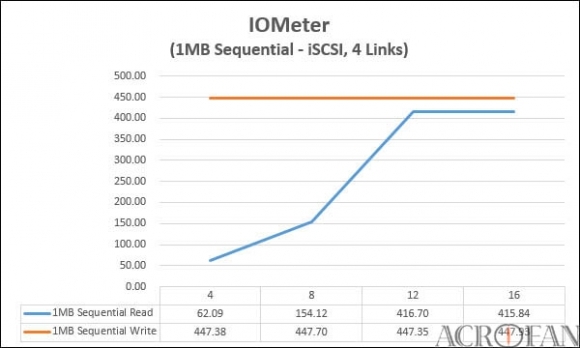 ▲ IOMeter(1MB Sequential, iSCSI 4 links), unit is MB/s, the higher the better. ▲ IOMeter(4KB Random, iSCSI 4 links), unit is IOPS, the higher the better. Four clients are seemed to have enough space in storage to read and write iSCSI connection sequential, total 16 threads. (The results of) sequential reads and writes with 4 clients, iSCSI connection shows that this storage has more margin in performance even reach 16 threads in test condition. In case of sequential write (simultaneously) by majority (lots of) users, RS3614xs+’s general performance or write performance distribution for each thread is very stable, and there is almost no change in performance as the number of thread increases. When 16 threads respectively perform sequential write, actually most parts become mixed patterns of random write. But in RAID 5, load distribution of storage inside is excellent. In addition, here, the use of a hard disk specialized at high load situation predicted at NAS such as majority threads’ writes would also contribute. The figure optimized for majority (multi) users’ simultaneous use can also be identified at 4KB random read and write performance. In 4 threads, when performance at a rate of read 1420 IOPS and write 860 IOPS approaches 16 threads, read falls at a rate of 1381 IOPS, and write falls at a rate of 655 IOPS, but normally this word load(workload) is needed to be considered that it is extreme load nearly impossible to come out. Moreover, at this time, it shows impressive processing storage performance level as read performance of total storage is (dropped) only 3%, and its write performance is about 24% (dropped). 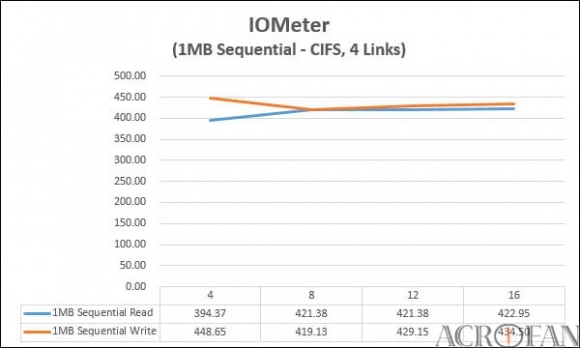 ▲ IOMeter(1MB Sequential, CIFS 4 links), unit is MB/s, the higher the better. We can also find that processing storage performance has enough spare in CIFS connection sequential read and write results of 4 clients contrasting (considering) test configuration and basic network configuration. In sequential read and write, up to 16 threads, change of general processing performance (their performance change) is not big. Performance for each thread is distributed equally, and even uses network performance limit. Things to be desired in sequential sending results from majority (of multi) threads are rather network bandwidth which is doing just enough. Although it is a back-off configuration at performance as a configuration of twelve 3.5 type disks for getting big capacity at a relatively low price is a standard. If mainly use sequential sending workload at configuration used in test, network interface will be able to extend, and maximize availability of general storage performance. 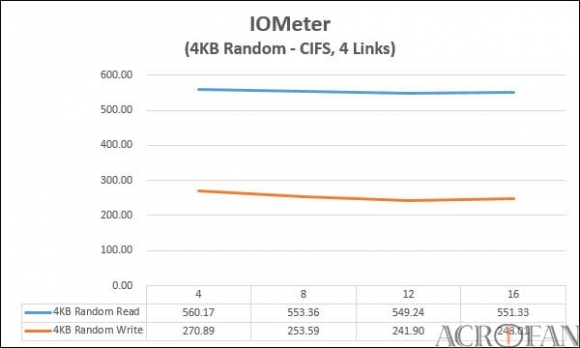 4KB random read and write performance at CIFS show low performance compared to iSCSI in aspect of connections’ distinctively high overhead. However, up to 16 threads, the characteristic is that the range of read and write change is almost none. Even though there is a bottleneck due to overhead, it gives us some slight idea of having inner processing performance with enough spare even in situation with lots of simultaneous users. 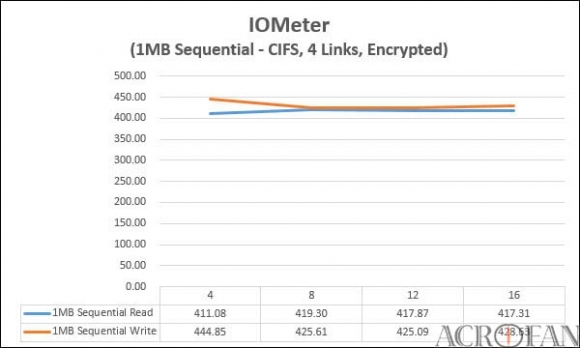 ▲ IOMeter(1MB Sequential, CIFS 4 links, Encrypted), unit is MB/s, the higher the better. 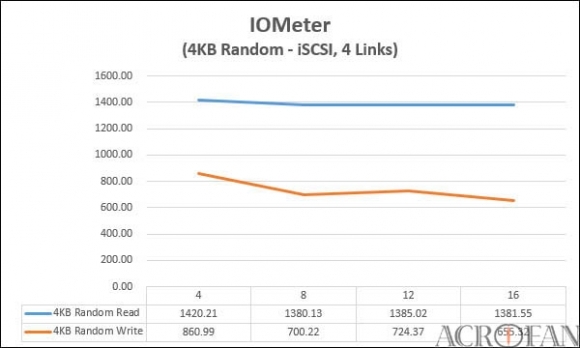 ▲ IOMeter(4KB Random, iSCSI 4 links, Encrypted), unit is IOPS, the higher the better. 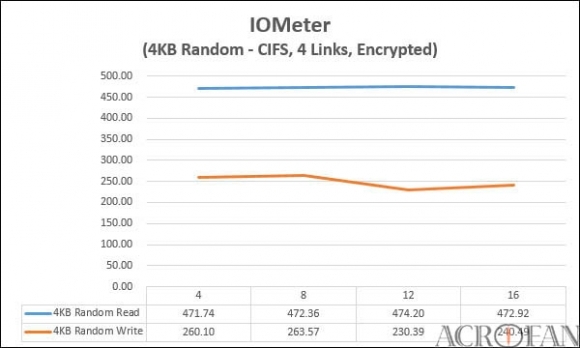 Performance of encoded(encrypted) CIFS sharing folder does not have much difference from performance of about 4Gbps for a basic test configuration and performance which is not encoded with only 16 threads. 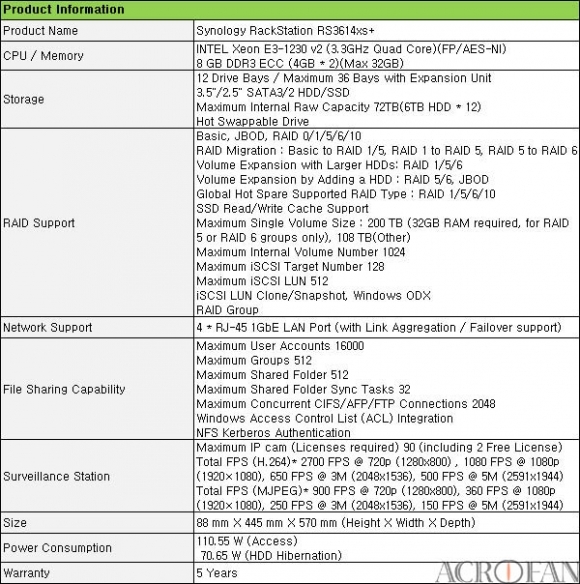 This is because Xeon E3 processor with quad core configuration, AES-NI hardware support and etc. are applied. In case of read performance, the dynamic range can be seen as margin of error. Write performance seems to be falling after 8 threads, but it seems very stable until 16 threads. 4KB random read and write performance in an encoded(encrypted) sharing folder show difference depending on encryption. In case of random read, it fall s about 15% of performance, but there is almost no change in spite of increasing threads. This is because disk configuration of storage and overhead part during encoding process show bottleneck phenomenon and it seems that the aspect of pure encoding process performance yet has some spares. There is a slight drop in performance of 4KB random write, but the width of decline is not much meaningful. In addition, it can be inferred that the importance of encoding in bottleneck phenomenon is small by 4KB random test results. IOPS in 1MB block’s sequential write is higher than 4KB random write. Also, that there is not much affection to encoding availability can be seen that encoding process performance itself has tremendous spares in 4Gbps network system. ■NAS has performance, economic feasibility, and flexibility. Synology RackStation RS3614xs+ is NAS that composes economically mass storage in business(enterprise) environment and concentrates on being used in various ways. Moreover, a 3.5 type SATA hard disk which is inexpensive, large capacity compared to price, practical performance, and reliability, makes gigabit Ethernet, the most general configuration, as a basic composition, and its characteristic will be stably providing various functions based on strong hardware performance. When only thinking about maximizing hardware performance of NAS, you might doubt that 10G network is a base for 12bay NAS which can have high sending speed, but replacing original gigabit system to 10G network for this is very burdensome. In addition, as more can be done for extending for users who can take the risk, extending gigabit port based NIC will be one of methods to making the best use of RS3614xs+ only when take problems of wiring’s dirtiness and the number of ports. A hard disk also uses SATA for optimizing price, but if system is 12bay RAID configuration and constantly operated, it will be better to use the disk optimized for this. This optimizing part is also the reason why Seagate’s hard disk lineup for NAS is divided into three parts such as a configuration and interface. Moreover, if make well use of a new combination which might be tricky, you can satisfy necessary parts with less price than original enterprise storage.